Today, I would like to talk about the experience of hunting (in Germany) and of the challenges and possibilities for conveying this experience ethnographically. More specifically, I am interested in hunting as a sensory practice, i.e. as a way of perceiving and engaging with the landscape. In the first half of my talk I would like to focus on an often overlooked aspect of hunting, the waiting before the kill. Hunting may or may not culminate in an act of killing but something important happens before. It is the sheer endless waiting in a state of heightened awareness and observation I call vigilance, i.e. a consistent, active and multisensory engagement with one’s surroundings, a way of being alive to the world that manifests in minute adjustments of movement, posture, gestures, weapon handling, eye ball motion, etc., always being drawn by the possibility of an animal being out there somewhere. In this state of vigilance, hunters often feel immersed in the landscape and weatherworld around them, becoming part of their surroundings. I will argue that it is this sense of immersion that complements the sense of anticipation for the animal and that both together make up the cardinal structure of the hunter’s perception of and engagement with the landscape. In my own fieldwork on hunting practices in Germany (ongoing since the end of 2014) I have followed Freiherr Speck von Sternburg’s recommendation to go out with hunters and to experience for myself and made it foundational to the methodological considerations of my research. I started out by participating in hunts in my local area around Koblenz, Germany, until I found a mentor (quaintly termed Lehrprinz in the German specialist language of hunters) to take me on in an informal apprenticeship. During the course of one year I learned some of the practical skills involved in hunting (tracking, animal behaviour, butchering) – with the exception of shooting which is legally restricted to examined and licensed hunters. To get past that restriction and therefore to participate more ‚radically‘, I then went to a hunting school to be prepared in a three-week course on the theoretical background knowledge of hunting in Germany (animal behaviour, hunting ‚traditions‘ and techniques, dog handling, legal issues around hunting, nature conservation) plus shooting training (with gun and shotgun). With my exam passed and hence my hunting license in hand, I finally had to acquire a hunting permit in a state forest managed by my mentor (one of the local foresters) and since then are allowed to fully participate in (almost) all hunting practices. In anthropological terms, I have employed ‚apprenticeship as method‘ (Downey et al 2014) – a special form of participant observation that involves the fieldworker in a more or less formal learning and teaching setting where he or she is accepted in a learner’s role alongside other novices from that community of practice. Apprenticeship research opens up new avenues for fieldworkers to learn cultural knowledge in terms of a practical mastery of skills, and thereby to learn about this type of knowledge and how one learns it (Downey 2005:53). More specifically, I have been engaged in what Sarah Pink calls a ’sensory apprenticeship‘: learning to hunt means learning to perceive like a hunter, to move like a hunter, to act like a hunter. Through repeated practice I have acquired the ’skilled perception‘ (see Grasseni 2004) of a hunter, i.e. my senses have been educated and trained within a hunting-specific ecology of practice. As a consequence, my own body and my own senses have become the primary methodological tool in my fieldwork. With this background in mind, let me now turn to the hunters‘ way of perceiving the world that I call vigilance. Every sociocultural practice has its own distinctive way of organizing, structuring, mobilizing or restricting the senses. Vigilance is one such ’sensory regime‘ (Sinnesregime, Reckwitz 2015) through which the culture of hunting in Germany becomes accessible. But what exactly is vigilance and how does it help us to understand what the hunter in the film did while waiting? for a being who is alive to its surroundings, experience does not mediate between things in the world and representations in the mind, but is intrinsic to the sensory coupling, in perception and action, of the awareness of the self to the movement of those features of the environment selected as foci of attention (Ingold 2000: 105, my emphasis). Put differently, experience in skilled engagements is less about ‚content‘ (neither reflecting on what one is doing at the moment nor daydreaming) than it is about an attentive way of being in the here and now as one is busy perceiving the ‚foci of attention‘ that are salient in completing one’s task and to respond to them. Naturally, there are moments within the flow of an activity which are given to more reflective modes of awareness, as in moments when things do not go as planned, something unforeseen happens, or one engages in routine automatisms that lend themselves to daydreaming. These are the contents of experience that are hard to come by for anthropologists through observation but might be retrieved (or not) by conversations or interviews. But perception as a sensory practice is accessible and visible to the anthropologist as sensory apprentice, because perception is an action of an attentive body moving in its environment. In the film, we thus see the hunter scanning the landscape (i.e. the field of vision) with her eyeballs, tilting her head, adjusting her stand, moving back and forth, turning this way, turning that way – because she is part of the field of vision and every small adjustment on her side transforms the field’s tensions and thus reveal a new Gestalt. All the time, her adjustments – as a sensory coupling of the self and world – are guided by a ‚vague feeling‘ for the ‚object‘ she is after. But as long as no ‚real‘ object has formed, her experience is not separated into perceiving subject and perceived object – both are still undivided but not without ‚imminent order‘, as part of the visual world. Unsurprisingly, this attentive perception or vigilance might give rise to a sense of immersion in which „small insignificant events then take on meaning because of the way things hang together“ (in a perceptual Gestalt, we might say). This intentional thread with the animal (most often absent or hidden) is what gives the hunter’s perception direction, position, perspective, and orientation. The immersion in the sensory world is not contingent; it is always structured and organized in relation to the animal. In the absence of the animal during the wait hunters watch out for indirect presences of the animal. Through repeated practice and trained, skilled vision they have learned to perceive the Gestalt of animals before it has fully formed – by sudden transformations of the field of vision that may announce the coming of an animal. So far I have focused solely on vigilance as a form of visual perception, a form of observation (although not a distanced one but an immersed, affective one). However, vigilance is a multisensory form of perception, with a focus on the audio-visual. The sudden transformations announcing an animal may be found in the field of vision (moving twigs or leaves), in the soundscape (remember the calls of the magpie in the film!) or, less commonly, in the ’smellscape‘ (spicy odour announcing wild boar). Having discussed the hunters‘ vigilance as a hunting-distinctive sensory regime, I now turn to the question of how to ethnographically represent such a sensory practice. It has been a long held aim of ethnography to accurately and authentically document and re-present fieldwork experience and the so-called ’native’s point of view‘. Yet the Writing Culture-debate has taught us that the ‚repetition of the same‘, as the paradigm of ethnographic realism, is an illusion: any form of representation is a construction and as such is historically situated, negotiated, contested, a rhetorical performance, a partial truth and, ultimately, fiction. Inspired by approaches from literary criticism and semiotics, the ‚crisis of representation‘ was one of the written text first. However, as documentary film had always had a reputation for ’showing the truth‘, it did not take long to undermine the realist claim of film as well. As ethnographic films can be considered fiction as well, what may a documentary be good for? Going back to Malinowski, Paul Stoller re-phrases the ethnographic aim of accurate representation: “ to write a document that gives the reader a sense of what it is like to live in the lands of others“ (Stoller 1989:8) and „to produce an ethnographic literature that gives readers a taste of ethnographic things.“ (ibid: 11). And since then, the call for sensory evocation has grown continually louder (Stoller 1989, 1997; Pink 2007; Cox et al. 2015). During the same time, ethnographic film has – perhaps for the first time in the history of anthropology – gained value as one of the most apt means for sensory evocation. Consider my documentary short The Beauty of Hunting in this regard. Filming turned out to be problematic. Not only had it been raining continually throughout the whole day I was filming. I was also limited in positions I could film from and hence perspectives I could shoot, as I had to be out of the hunter’s line of fire at all times. Accordingly, no scenes were staged or could be repeated. I had to follow the unfolding of the action as it happened. 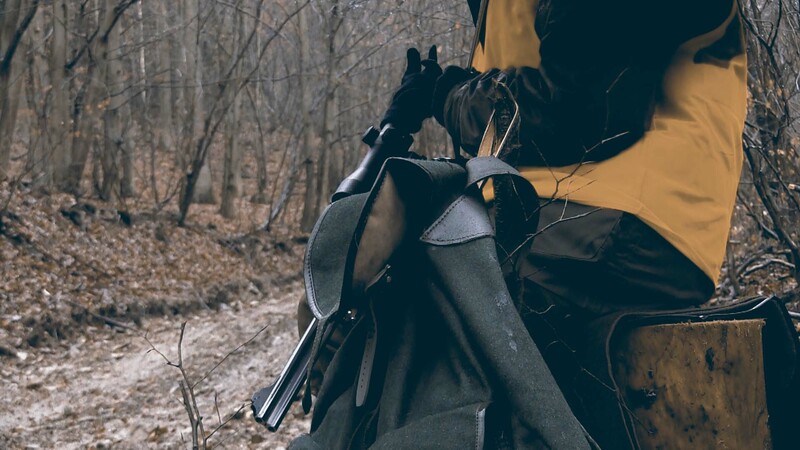 But what is more, my attention and sensuous presence in the landscape had to mediate my filming on the one hand and the demands of the hunting situation on the other hand: I had to film in a way that was unobtrusive so that my presence did not give away the presence of the hunter. This corporeal way of filming was, however, what made the atmospheric shots possible in the first place and so were a welcome challenge to the process of filming. It is in this sense that filming as skilled vision can be conceived as a form of visual knowledge and documentaries can be re-considered from being a form of ‚knowing about‘ (documentation, representation) to being a form of ‚knowing with‘ (evocation, correspondence). „… the intimate coupling of the movement of the observer’s attention with currents of activity in the environment. To observe is not so much to see what is “out there” as to watch what is going on. Its aim is not to represent the observed but to participate with it in the same generative movement (Ingold 2011: 223). In a phenomenologically-inspired film this means adopting „an aesthetic that favors long takes, synchronous speech, and a tempo faithful to the rhythms of real life, and that discourages cutting, directing, reenacting, interviewing“ (Tylor 1996:75). This aesthetic goes against the grain of what Rane Willerslev and Christian Suhr (2012) recently argued in an Current Anthropology article, namely that it is by disruption through montage that a film might educate. The authors prefer a model of learning that is built on breakdowns and mistakes that give opportunity for conscious reflection. The approach I have just described follows instead a model of learning that is based on learning by demonstration, observation and imitation (see Gieser 2008, Ingold 2000, Jackson 1989). I do not want to suggest that the former model is wrong; just that it leads to a rather different kind of knowledge: here, a reflective, conscious ‚knowing-what‘; there, an embodied, tacit ‚knowing-how‘. So while film lacks the synaesthetic character and field of vision of first-hand experience, the reflective situation of watching a film might actually assist the learning of visual knowledge. Therefore, I would like to ask you to watch the film again and again, by yourself perhaps, and to refrain from asking questions, passing judgement or thinking about the knowledge that might be conveyed in it. But instead to just watch what is going on, to let your attention be guided and drawn to what is shown to you and thus to give yourself the chance to learn with, i.e. to know with, the film by adjusting your normal vision in correspondence with the vigilance of the hunter.